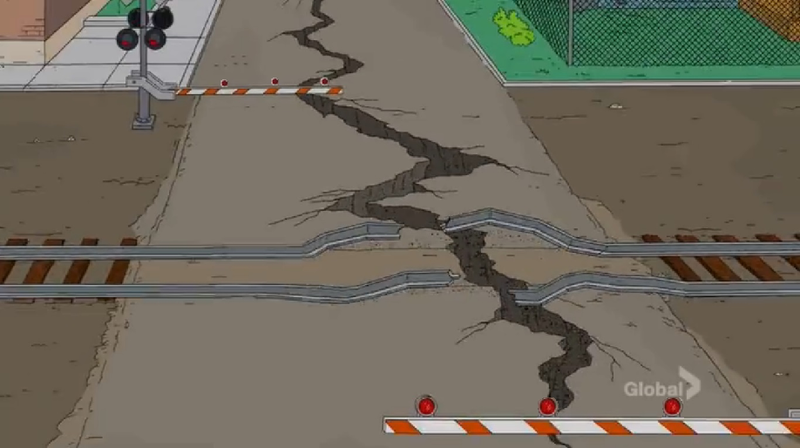 Are there any railroad crossings (railway crossings/ level crossings) on Phineas and Ferb? Not just any railroad crossings, crossings with lights and or gates/barriers. The one on Paw Patrol is okay too but could be better. This is from a blog I posted on The Simpsons Wiki, but PLEASE NOTE the screenshot is modified, it's not real! I've been looking for railroad crossings on this cartoon (I do this eith just about any cartoon) and so far haven't seen one. If any of you know any episodes that have railroad crossings, or see one before I do, please let me know and which episode(s) it's on. Preferably a gated crossing but a lighted crossing without gates is fine too. If there isn't one, but the series hasn't ended yet, I hope they include one. To learn more about me, please click on my username, go to my profile, and go either to Arthur Wiki or Fairly Odd Parents Wiki. See also my fanfiction.net and Deviant Art pages.